(CNN) — Algerian President Abdelaziz Bouteflika has announced that he will not seek a fifth term in office and that the April 18 elections are postponed, after weeks of protests surrounding his candidacy. The ailing 82-year-old, who has ruled the country for two decades, sparked mass protests after he announced his candidacy for the upcoming elections. He has rarely been seen in public in recent years after suffering a stroke in 2013. Addressing the Algerian people directly, the letter described the decision as a “response to the urgent demand that you have made of me” and promised that the “succession between generations” is inevitable. Shortly after the announcement, Algerians took to the streets to celebrate the news, draping themselves in the national flag. In a series of announcements, Bouteflika also said he would reshuffle his cabinet. Prime Minister Ahmed Ouyahia resigned on Monday and was replaced by Interior Minister Noureddine Bedoui, whom Bouteflika has asked to form a new government. Despite being a largely absent ruler because of his ongoing health problems in recent years, Bouteflika refused to relinquish his grip on power. It’s become widely believed that he has spent his time as president largely incapacitated and has recently left the reigns of the country in the hands of a military and civilian elite. First elected in 1999, Bouteflika originally won praise in his first two terms for steering his country back to stability following “the black decade” of the 1990s, when a bloody civil war left more than 150,000 dead. 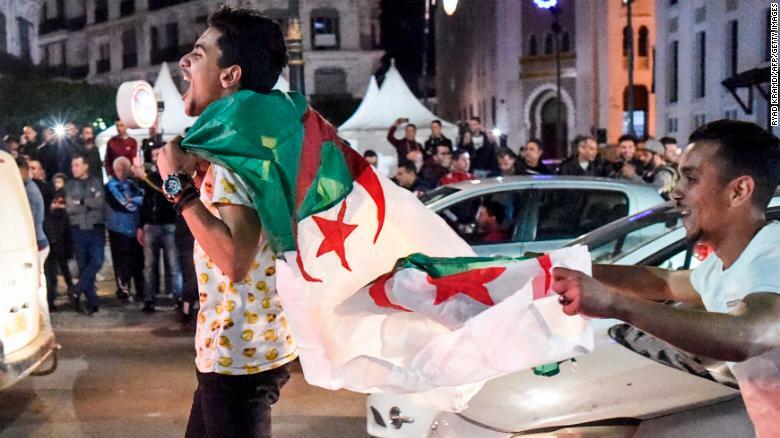 While small protests broke out in 2014 after Bouteflika won a fourth term, this time around Algerians had finally had enough. “He’s been there for 20 years. He’s been very sick since 2013. He hasn’t been able to talk to his people for the last six years, let alone govern,” Dalia Ghanem, an Algerian resident scholar at the Carnegie Middle East Center, previously told CNN. Popular disillusionment had spiraled over the undemocratic rule of “le pouvoir,” or the power, as the established clique propping up Bouteflika has become known as. While protests are fairly common in Algeria — with high levels of unemployment and the country suffering a debilitating financial crisis as a result of a collapse in oil revenues — experts argued that the recent demonstrations were different. She said that while the protests started as student-led demonstrations, they now involved people from different generations and backgrounds — students, lawyers, doctors and the unemployed. CNN’s Jennifer Hauser, Schams Elwazer and Lauren Said-Moorhouse contributed to this story.